Planned requests are used to automatically create service requests or change requests for work that needs to be done on a regular or variable basis. They can be used to manage and plan preventive maintenance or equipment maintenance for; IT, Facilities Management, Biomedical Engineering or other teams. The requests generated from a planned request are internal to the department and cannot be queried or viewed by end users. A good knowledge of both Configuration and Reference data management modules will facilitate the understanding and configuration of the planned requests. If personalized assistance is required, please contact us and we will be happy to evaluate your needs and assist you in the implementation of this solution. Planned requests can be configured in the Options and Reference data management, combined with specific configurations done directly in the Planned request module (detailed in the Planned Request Configuration section below). To control more efficiently access levels of Octopus, permissions to administer Octopus and to plan requests can be given to two different Octopus users. From Tools > Options > 3 - Important general options menu. In Visible and required fields section, Estimated effort field needs to be checked to make it mandatory when creating planned requests. Otherwise, Planned effort breakdown chart cannot be visualized. Default values, specify a site and a user. Values will be used in requests issued by a planned request when they are not found in the system. NOTE: When you activate the Estimated effort field, if you already have planned requests configured without estimated efforts, you will be notified to specify efforts so that Planned effort breakdown chart correctly represents all planned efforts. Some of the information necessary to the planned requests is configured from Tools > Reference data management menu. A planned request can be based on a Change template. This template must already exist for it to be available when creating a planned request. Right click on Template to add a Change or click on an existing Change template to modify it. The group / assignee responsible for maintenance of a CI is identified in the Maintenance tab of the CI. Group assignment is recommended as opposed to individual assigning to ensure that requests are still completed if the assignee is not available (vacation, absence) and to prevent from having to redo the configuration if the person changes functions. A planned request can be based on a service request. The service request template must already exist for it to be available when creating a planned request. Right click on Service request to add a new type of request or click on an existing one to modify it. For more information on the configuration of service requests, please consult the Service Request Types wiki. Use it to group requests of similar types to facilitate sorting of the work to be done, or to analyze data in a report. Once the categories are created, they can be selected from a list when creating a planned request. Go to File > Planned request management. From the Actions menu, select Create planned request to open the New planned request window. Select an applicable category from the list. Remember that categories must first be created in the reference data management - See the Reference data management section. Note : The use of this field is not mandatory. In some teams, there may be a large number of planned requests. Categorizing them will help to sort out the workload and/or analyze data through reports. IT: IT security, Critical equipment maintenance, Equipment capacity. Building facilities: Maintenance of beds and levers, Maintenance of heating / air conditioning systems, Building Safety. Biomedical engineering: Minor, Major, Mandatory. 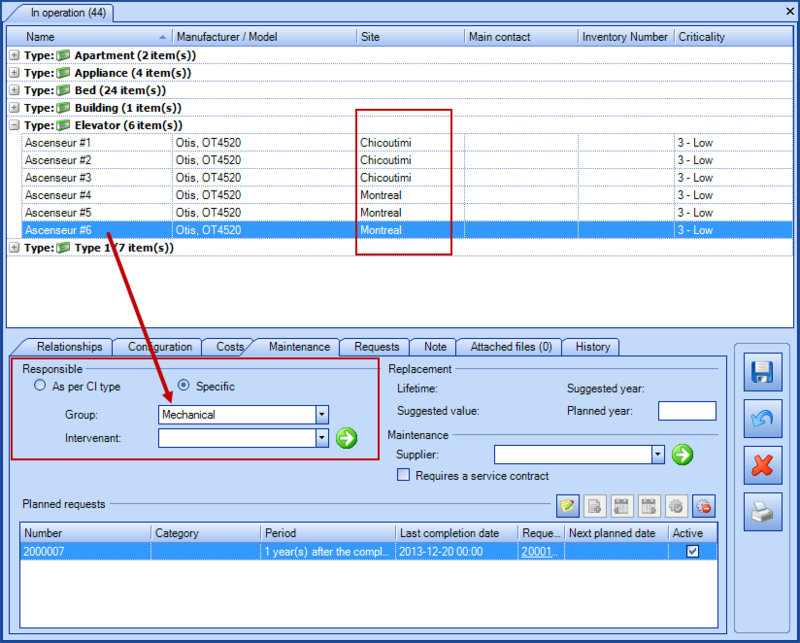 The category for one or multiple requests can be modified from a list by clicking Modify category from the Actions menu. Use Category column in lists to sort or group the information by category. Specifies the estimated effort needed to complete this type of request (format hour:minute). To be able to compare the estimated or allocated time to the actual time required to complete the request. 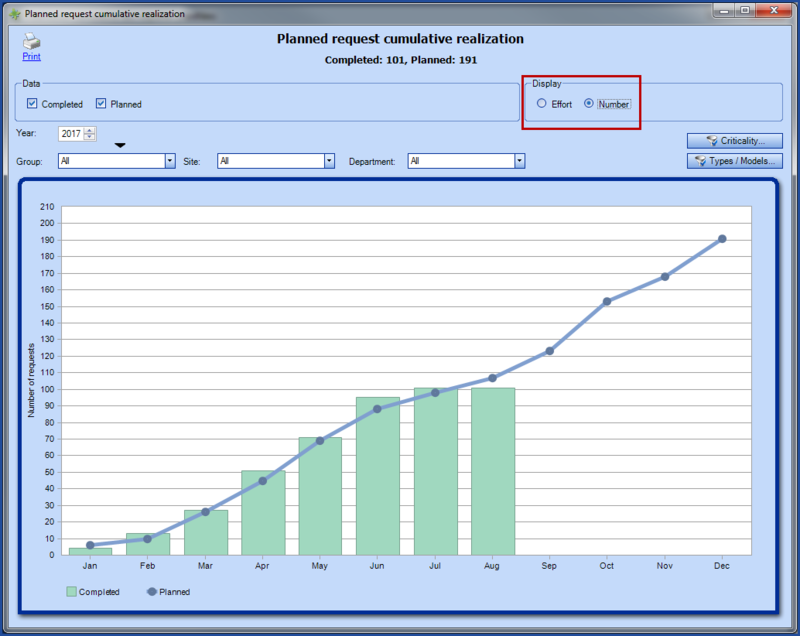 Allows to view the planned requests in the Planned efforts breakdown graph. Add the estimated time in the required format, for example 00:30, if the time to complete the request is estimated to 30 minutes. The estimated effort will not appear directly in the request, but it is visible from a list. Add the Estimated effort column under the Planned request to a list to see the value. To compare with the actual effort, add the Total effort column. 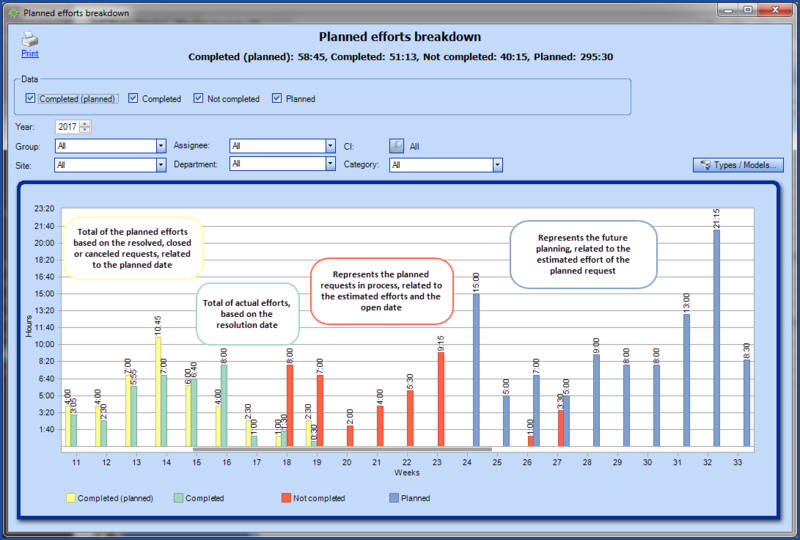 When a planned request does not contain any estimated effort, it cannot appear in the Planned efforts breakdown chart. Checkbox that can activate or deactivate a planned request. Requests can also be activated or deactivated from the Actions menu. The button controls the date of automatic activation or deactivation of a request. To trigger the activation or deactivation of a request at a specific date. Use the date in combination with the appropriate status (see the visual explanation below). Note that a request that has been deactivated will no longer appear in the Planned requests list; but it will be in the Inactive planned request one. For an automatic activation, the next planned date will be below the field. The Mode and the Details work in combination to determine when and how many times a request will be generated. The Options indicate if the request will be created in advance or on the creation due date. When created in advance, the request will automatically be suspended with the reason Planned request created in advance. On the creation due date, it will activate itself and will appear in the list of new requests. The request will generate according to the number or recurrence indicated in days. For example, 1 day will generate a request every day, 2 days will generate the request every 2 days, etc. The request will generate according to the number of recurrence indicated in weeks, on the specified day of the week. For example, recurrence 1 week - Thursday, will generate the request every Thursday. 3 weeks - Tuesday and Friday, will generate the request on Tuesday and Friday, every 3 weeks. For a request that needs to be created every 2 years, use 104 weeks. The request is generated on the day or days of the specified week or weeks. For example, it is possible to generate the request on the Mondays of the 5, 10, 15, 20, etc. weeks. A year is 52 weeks and a few days and since January first does not always fall on a Sunday the weeks 53 and 1 of the next year can overlap. This explains week 53 existence. It is possible to select specific weeks. The number and date of the week is visible to help in the selection. Results of the weeks selected. The request will generate according to the month(s) selected, whether at fixed dates (the 15th of the selected month(s)) or on fixed days (the first Monday of the selected month(s)). It could give a combination like every second Saturday of March, July and October. The variable mode can use two triggers: after the last completion or after the creation of the last request. Combined with the number of days/months/weeks/years, we could have a request created 2 years after the completion of the last request OR 6 months after the last created request. Planned requests can be configured to create a service or change requests. 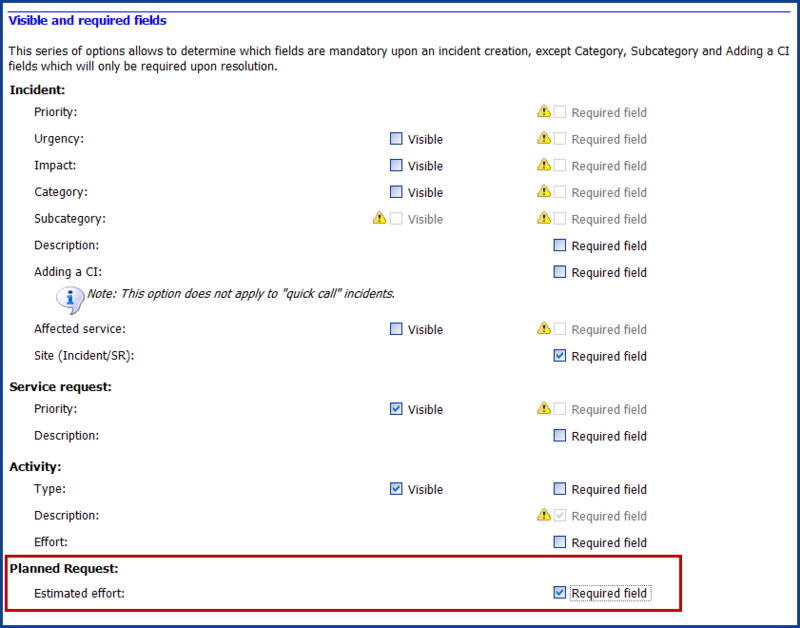 A service request named General Planned Request is selected by default. It is possible to add other types of service request or change request templates from the reference data management. It needs to be done by an Octopus user with the permission to Administer Octopus. (See the Permissions section). The specific subject will always be the same. But the automatic one will be composed of information from the planned request. Contact the Octopus Service Desk to modify the default subject. This part will remain empty. Template name - [Next planned date]. There is only 1 CI. Template name - CI name - [Next planned date]. There are multiple CI in a common request. Template name - Multiple CI - [Next planned date]. There are multiple CI each with its own request. The group/assignee configured in the "Maintenance" tab of the CI type. If a group/assignee "Responsible" has been configured in the "Maintenance" tab of the CI, it will take precedence over the one configured in the CI type. Finally, if no responsible group/assignee are configured in the CI or CI Type, the system will assign the request to the Service Centre. This option will assign the request to the group/assignee defined in the SR type or to Service Centre if none have been identified. With this option it is possible to specify exactly the group/assignee for the request. The procedure can be automatically included in the planned request. This way it is possible to use the same SR type with different instructions. One or more files can be added to the planned request if required. *The examples mentioned above are linked to the option A request for each CI. If the planned request is in the Common request for all CIs, the selection method for the assignment, the requester/user and the site will be the first value available from the CIs. The selection technique must return a value if there is a consensus for all CIs. For example, the site considered will be the one shared by all the CIs. If it is not the case, then it will be the site of the main contact if the same contact is shared by all CIs. If no consensus is found, then the default values configured in the options will be used. Please note that the date format displayed in the subject is the same as the Octopus server date format, but it can be modified via a setting accessible by our support team. If you would like to have this setting modified, please contact us to send a request via our Web portal. When new CIs are added, they automatically inherit the planned requests configured by type or model. This is very practical and avoids forgetting CIs in preventive maintenance. It can happen that a request generated from a planned request will not be linked to a CI; in this case, leave the default value of No CI. Usually similar equipment will require similar types of maintenance. It is possible to filter the CIs by site or sub-site. Adding a site implies that all the CIs from the site or sub-sites inherit the scheduled request. It is simpler in this case to create only one planned request for a CI type. It is possible to exclude one or more models of the CI type selected. In an environment where CIs are filtered by site or sub-site is used, the CIs will inherit maintenance accordingly. Any movement in the structure of the sites/sub-sites or modification of the CIs, will automatically adjust the planned requests of the related CIs. If a planned request is required only for one model of CI, the best method will be by CI models. If more than one models are concerned, then the CI type method would be best. In an environment where CIs filtered by site or sub-site is used, the CIs will inherit maintenance accordingly. It is possible to pick one or more specific CIs for a request. Use the advanced search button to find the CIs using multiple criterias. For example, to find a type of equipment from a specific site, add search criteria in the General and Classification tabs. From the results found by Octopus, you can use the regular Windows techniques to make your selection (CTRL+Click, SHIFT+Click, CTRL+A) to add the CIs to the planned request. Number of CIs per request. If separate interventions are required or if parts are required, the best practice would be to have one CI per request. Note that if the option for A request for each CI is selected, the Next planned date will remain empty, even if there is only one CI included in the request. Distinguish between types of requests. As it is possible to get regular types of requests as well as planned requests, to distinguish between the two types, add the Planned Request columns. If the request is from a user, the field will remain empty. Find CIs without planned requests. To find CIs that are not related to any planned requests, do a search from the CI module for the Number(Planned Request) field that is empty. This search can be saved as a list. Data under the CIs tab cannot be modified as long as there is an active request generated by a planned request. If you need to modify the relationship between the CI and a planned request, make sure all SRs and changes generated by this planned request are completed first. To find out if there is still an active request generated by a planned request, add the Request column to the list of planned requests. Building Management is often managed around the physical sites and if you have defined your Service Desks according to the sites, the planned requests can automatically be assigned to the right group, as in the scenario below. Follow the link to find out more about how to configure more than one Service Desk. A company has 6 elevators, three in Montreal and three in Chicoutimi. The Chicoutimi site is configured to use the Chicoutimi Team as their service desk. In a planned request associated to the Elevator CI, the assignment will be done according to the service desk, unless another group is mentioned in the CI or the SR type. The #1, #2 and #3 elevators are associated to the Chicoutimi site. The #4, #5 and #6 elevators are associated to the Montreal site. In the CI file of elevator #6, it says that the maintenance group is Mechanical. Requests for #1, #2 and #3 elevators will be sent to the Chicoutimi Team group. Requests for #4 and #5 elevators will be sent to the Service Desk group. The request for elevator #6 will be assigned to the Mechanical group. Requests for #4, #5 and #6 elevators will be sent to the Service Desk group. All the requests will be sent to the selected group. Displays all activate planned requests. Lists all planned items related to the planned requests. Displays all deactivated planned requests. This section explains in detail the two available lists in the favourites and how to get the most of the them. It is from this list that you will be able to create, consult and modify your planned requests. Other columns can be very useful in this list. We suggest the following, but others can be added depending on the needs. The Next planned date will remain empty in the list of Planned requests if the option A request per CI has been selected. This is normal if many CIs are linked to the planned request, but it is true as well if only 1 CI is linked. If you want to see the date, change the type to Common request for all CIs. See below for an example. Image A shows A request for each CI and image B shows Common request for all CIs. It is very important to understand how to use this list as it will become a useful tool to organize planned requests (or preventive maintenance (PM) as the department may call them). Featured Items in this list represent active planned requests and their CIs. 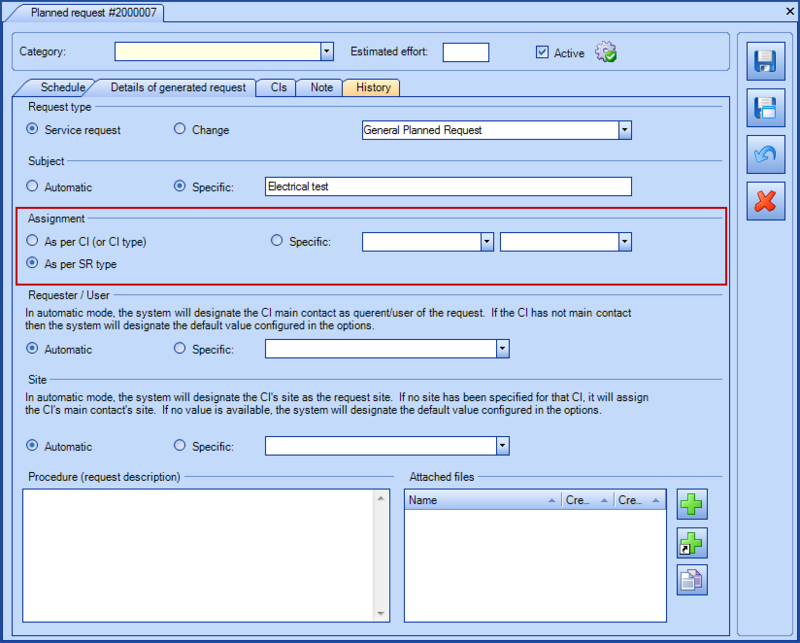 The number of items related to a same request may vary depending on the CI selection mode. Except for the No CI mode, otherwise there will be as many items in the list as there are CIs for the selected modes. One of the most interesting feature from this list is that CIs can be managed individually (deactivate a specific CI, change the next planned date, modify the last completion date, etc.). Items in this list represent all the SR or change requests that will be created as per the instructions configured in the planned requests. 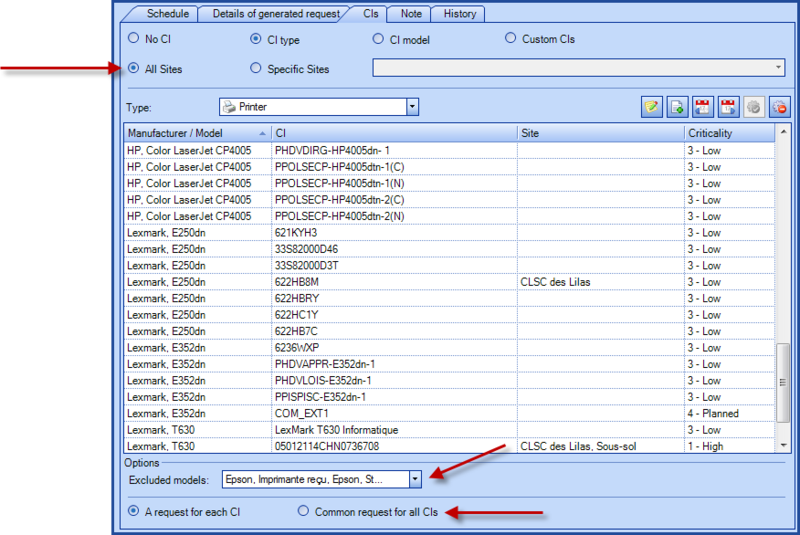 The number of items related to a planned request depends on the CI selection mode. From the Planned request items list, double-clicking on an item will open its CI file as shown below. Also, with a right click the following options are available: Open the planned request related to the CI, Open the CI. The action menu can vary according to the list selected. To create a new planned request. Can be used directly in the Configurations module, after selecting one of more CI. From the Inactive planned request list. To reactivate an inactive planned request. From the Planned request items list. To reactivate the creation of planned requests for 1 CI. From the Planned request list. To deactivate a planned request. To deactivate the creation of planned requests for 1 CI. Displays the distribution of the planned efforts. Allows to compare the number of realized requests compared to what has been planned. To select or modify the category for one or more planned request at once. Opens the planned request related to the item on the list. In this list, double-clicking an item will open the CI, not the planned request. To modify the note for the selected item from the list. To modify the date when the next request will be created for an item (not available if a request is already open for this item or if the item is deactivated). To generate the request now (not available if a request is already open for this item). To change the completion date of the last request (available only for planned request with the variable interval mode combined with the after completion option). This list will help organize the work that needs to be done. Certain steps are important, especially at the beginning, to ensure that the requests will be created at the right time for the correct CIs (equipment). Here are a few things that need to be checked before proceeding to the planning stage. Modify the next planned date (for one or more CIs). When a planned request is configured by CI model or type, all the requests will be created on the same date for those CIs. This step is important because it will help with getting the requests created at the right moment. Modify the last completion date (for one or more CIs). If the date of the last completion is known and the planning is based on the "x" time after the last completion parameter, this step is important, because it will enable the system to create the requests at the right moment. Note that the last completion date cannot be changed once a request has been created and resolved for this planned request. Deactivation of the execution for items (due to lack of time, manpower or because the CI is obsolete). With planned request based on CI type or model, new CIs of said type or model will automatically inherit the configured planning. However, there may be cases where this should not apply for all CIs. This is why a review of the items in the list must be done to confirm that all the CIs present in the list require the related planned request. The category field is useful to group and show in a single glance, items from the same category. Once a review of the planned request items has been done, the list can then be configured to fit the needs. Below are different scenarios using lists for 3 types of teams; the number of available columns and searches offers a multitude of possibilities. The IT examples are aimed at the Information technology teams, the BME examples are aimed at Biomedical engineering teams (or related to medical equipment) and the BF represents the building facilities department, technical services, etc. The planned efforts breakdown presents the whole year, broken down in weeks. The graph is only available from the Planned request management (from the File menu) by clicking the Planned efforts breakdown action. The subtitle of the graph shows the total efforts for each of the selected series (Completed (planned), Completed, Not completed or Planned). In the case where some of the planned requests do not contain estimated efforts, a message will indicate it under the title of the graph as planned request cannot be shown if they do not have estimated efforts. The graph can be opened in a side window if you use CTRL + Planned efforts breakdown action. Represents the planned efforts of the resolved, closed or cancelled requests. Considers the planned dates of the requests. Considers the estimated efforts of the requests. Represents the closed requests excluding the cancelled ones. Considers the resolution dates of the requests. Considers the internal efforts of the requests. Exception: Considers the reactivation date of the Suspended requests with the Planned request created in advance reasons. Considers the estimated efforts that come from the planned requests. Represents the planned request items. Considers the next planned dates as well as the next projected dates. Considers the estimated efforts of the planned requests. The projected planned requests items displayed following the drilling of the Planned series, these cannot be modified. Note: In the case of a planned request with a variable interval after completion with an opened request, the next projected dates are determined from the last planned date and calculated in fixed intervals. Data: Shows one or more options related to the previously explained series, Completed (planned), Completed, Not completed or Planned. Year: Allows to select the year of the data to display. Group and assignee: Allows the selection of the planned efforts by group or assignee. Site: Allows the selection of the planned efforts for a specific site or sub-site. Department: Allows the selection of the planned efforts for a specific department or sub-department. 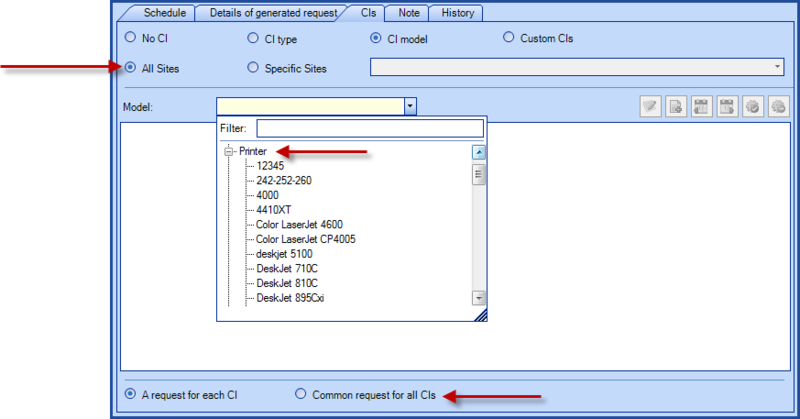 CI: The CI filter allows to use the advanced search by CI type or name, or any other CI criteria. Click the magnifying glass to open the CIs advanced search window and add your criteria. Category: Allows to filter planned request by category. To configure the requests and find out more about their benefit, see the Category section. Types / Models: Allows to filter the chart by the CI type manufacturers and models. Display values: Shows the effort value per week. To show the total completed or planned efforts, right click on one of the bars and select Display values. Display data: Allows you to drill data for a particular week. To view the data for a particular week, right click the bar of the desired week in the chart and select Display Data. You can also double click on the week to view the result of the data. Display horizontal lines: Allows to see (by default) or remove the horizontal lines in the graph. 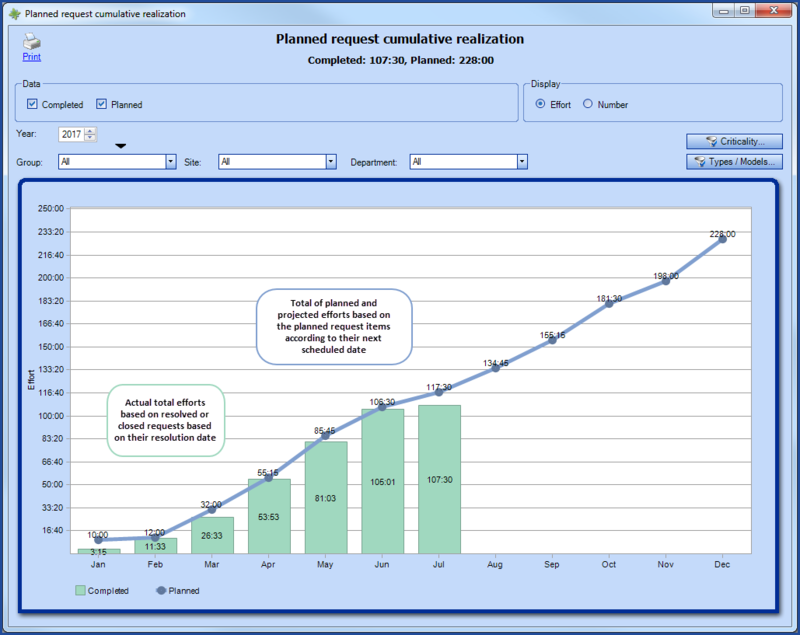 The Planned request cumulative realization graph allows to compare by Effort; the actual effort in relation to the planned effort, or in terms of the Number of completed requests versus the number of planned ones. This graph can be accessed from the Planned request management module (from the File menu) by clicking the Planned request cumulative realization. The subtitle of the graph shows the total efforts for each of the selected series, either Completed or Planned. In the case where some of the planned requests do not contain estimated efforts, a message will indicate it under the title of the graph as planned request cannot be shown if they do not have estimated efforts. The graph can be opened in a side window if you use CTRL + the Planned request cumulative realization action. Represents the Estimated effort configured in the planned requests. Combines the estimated efforts of planned request items (planned and projected) as well as the ones from requests that are open, resolved/closed or cancelled and were generated by a planned request. Considers the next planned date as well as the next projected ones. Represents closed requests excluding the cancelled ones. Combines the number of planned request items (planned and projected) as well as the requests that are open, resolved/closed or cancelled and were generated by a planned request. Considers the planned date of the planned items and requests. Data: Shows one or more options related to the previously explained series, Completed and Planned. 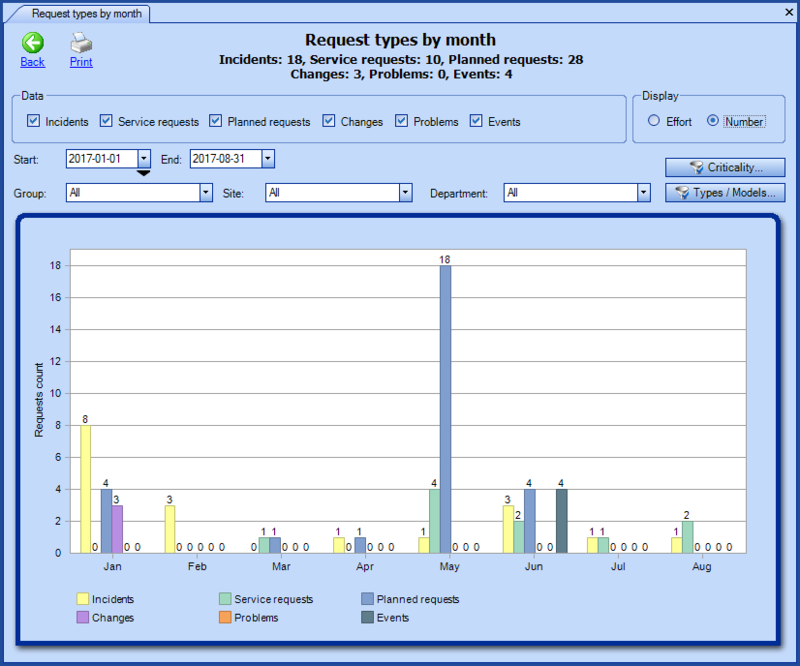 View: Data is displayed in the graph by Effort or Number (number of requests). Period: Represents a whole year or a specific period (with start and end date) when clicking on the black arrow. Group: Shows the cumulative data for the planned requests for a specific group. Site: Shows the cumulative data for the planned requests for a specific site or sub-site. Department: Shows the cumulative data for the planned requests for a specific department or sub-department. Criticality: Filters the graph by CI criticality. Types / Models: Filters the graph by manufacturers / models of the CI types. Display values: Shows the effort or number of requests according to the selected display. To show the totals in the graph, right click on one of the bars and select Display values. Display data: Allows you to drill data for a particular month. To view the data for a particular month, right click the bar of the desired month in the chart and select Display Data. You can also double click on the month to view the result of the data. Since the data from the graph represents the cumulative of the planned requests, when drilling, all the data from the beginning of the selected period until the selected month will be displayed in the list. To help with the display and group information, two new fields have been added Resolution Date (month/year) and Planned Date (month/year). For all the details on this report, see the Request types by month section of the Reports and Statistics Module Wiki. In order to exploit the use of lists to manage the planned requests, it is recommended to read the following article: List Customization. However, here are a few quick tricks to help maximize the use of lists. To add one or more column, all you need is to right click on the list to modify and select Select a column from the menu. To pick the required column place a checkmark in front of the field name or uncheck to remove, then press OK.
To facilitate the search of a column, use the filter field. Note that the required field may be present in more than one group. It is important to select the right one. To quickly group using one or more columns, use the top section provided for this purpose. From the list that you want to group by, right click and select Display > Display groups header from the menu. Then click and slide the column with which you want to group by. Refer to this article to find out how.